A 1,500 year old mosaic, depicting a map with streets and buildings, was exposed about two years ago in archaeological excavations the Israel Antiquities Authority conducted together with school children and employees from the Qiryat Gat Industrial Park. This extraordinary mosaic served as the floor of a church dating to the Byzantine period. It was removed from the site for the purpose of conservation and was recently returned to its permanent location in the industrial park. The mosaic will be revealed to the public for the first time at the “Factories from Within” festival to be held October 1, during the Sukkot holiday. 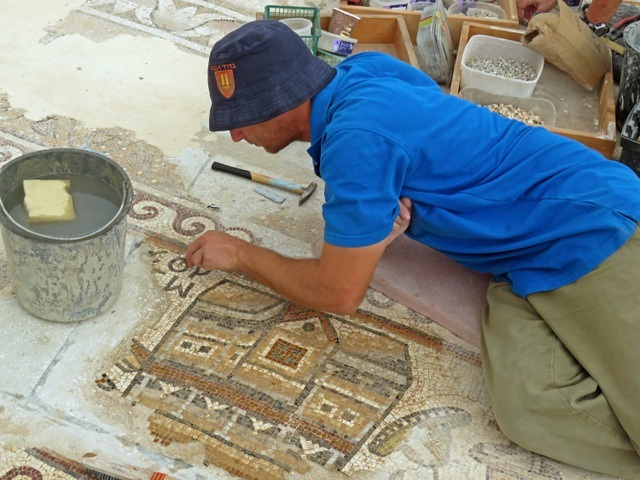 According to archaeologists Sa‘ar Ganor and Dr. Rina Avner of the Israel Antiquities Authority, “The appearance of buildings on mosaic floors is a rare phenomenon in Israel. The buildings are arranged along a main colonnaded street of a city, in a sort of ancient map. A Greek inscription preserved alongside one of the buildings exposed in the mosaic indicates that the place which is depicted is the settlement חורטסו, in Egypt. According to Christian tradition, the prophet Habakkuk was buried in חורטסו. The appearance of this Egyptian city on the floor of the public building in Qiryat Gat might allude to the origin of the church’s congregation”. The mosaic pavement was part of the floor of a church that did not survive. Two sections of the mosaic were preserved; animals such as a rooster, deer and birds and a special goblet with red fruits are portrayed on one part of the pavement. According to Ganor, “The artist utilized tesserae of seventeen different colors in preparing the mosaic. The investment in the raw materials and their quality are the best ever discovered in Israel”. A Nile River landscape in Egypt consisting of a boat with a rolled-up sail, streets and buildings is depicted on the second carpet. The buildings are portrayed in detail and in three dimensions, and they have two–three stories, balconies and galleries, roofs, roof tiles and windows.